Set your agenda, invite the right people and give your attendees time to prepare and contribute. 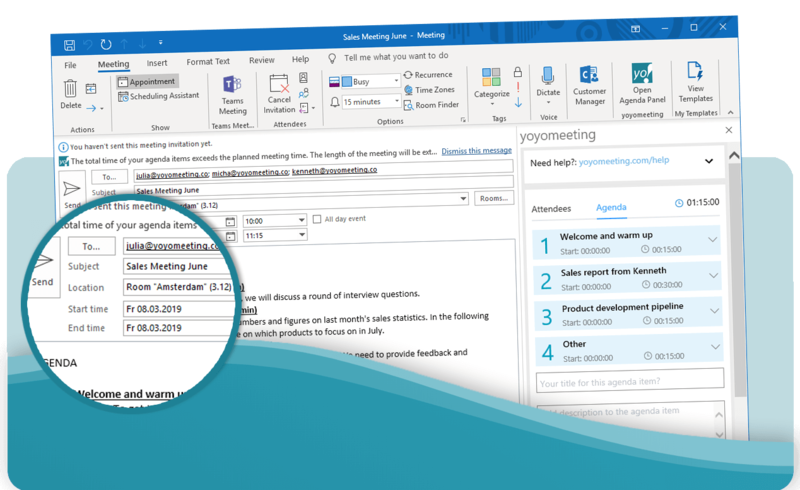 We developed yoyomeeting as add-in for Office 365 and Outlook on the Web (for PC and Mac), because we think, a new tool for productivity must integrate in your daily business routines instead of making you change your daily habits around a new tool. Otherwise usage will be poor. And if you don’t use it, there won’t be any productivity gain! 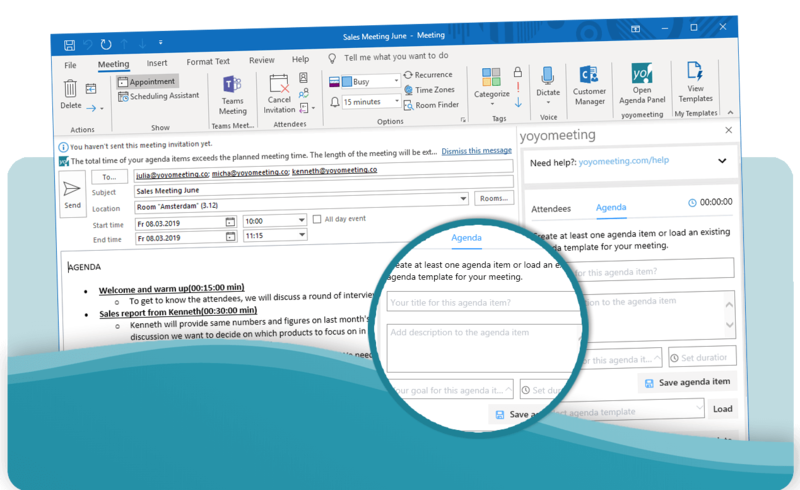 With yoyomeeting it is much easier (one click and a line of text) to prepare a good looking agenda item and furthermore, the tool reminds you to do so at all. You might say, this is common sense and too obvious. But when everyone would do it already, we would not complain about so many unproductive meetings, right? Most meetings generate tangible results only in the last couple of minutes when people notice, they are running out of time. No matter how long a topic is scheduled, if you have time left, you will use it for (sometimes unproductive) discussion. Therefore timeboxing (=limiting the available time for a topic) is a great way to focus your meeting on decisions and results. History shows, some people tend to get carried away while they are talking and they start discussions not helpful for a achieving the goal of the meeting. The goal? Ups! Sometimes meeting hosts just forget to set (or to communicate) such a goal in the heat of the moment of scheduling their meeting. 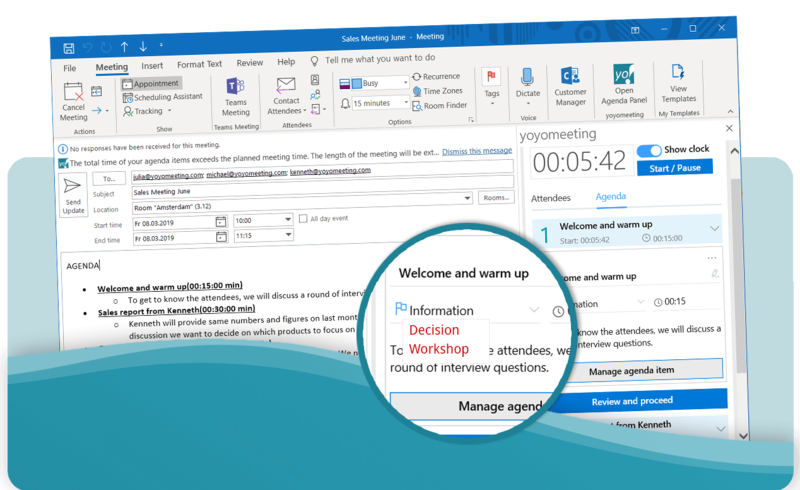 yoyomeeting will remind you to set a goal for each of your agenda items and show this to your attendees: “decision”, “workshop” or “information”. 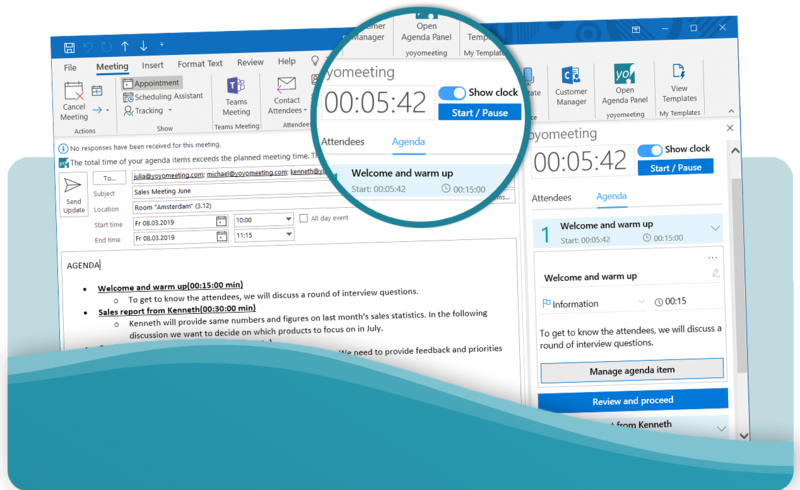 Learn more about "during the Meeting"